Ontario’s Government for the People has made a commitment to balance the budget responsibly. By restoring trust, transparency and accountability in the Province’s finances, the government will protect what matters most: health care, education and other critical public services by ensuring that they have the funding they need for generations to come. The Province took immediate action to end waste by halting unnecessary spending, ensuring value for taxpayer dollars and directing public funds to those who need it the most. 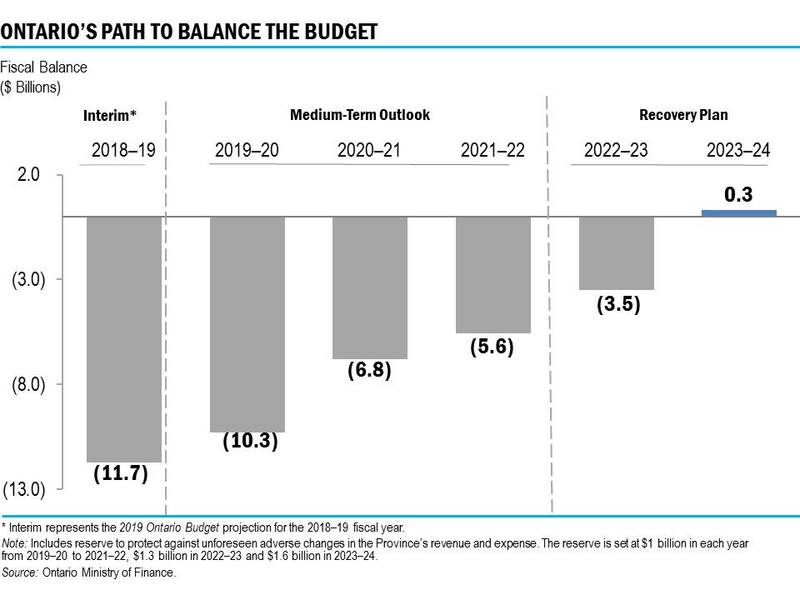 Ontario now projects a deficit of $11.7 billion in 2018–19, a $3.3 billion improvement from the deficit of $15 billion inherited from the previous government. This action also contributed to lowering the projected net debt to $343 billion in 2018–19, from the $347 billion reported in the 2018 Ontario Economic Outlook and Fiscal Review. By making smart long-term decisions, reinventing the way government delivers services and focusing resources on the individuals and families in greatest need, the Province is restoring trust, transparency and accountability — and balancing the budget in a responsible manner without introducing any new taxes. Ontario is charting a responsible path back to balance by 2023–24 while creating jobs and protecting what matters most — critical public services, including Ontario’s world-class health care and education systems. The government is also ensuring value for money and prioritizing spending, with projected average savings and cost avoidance of about eight cents for every dollar spent over the path to balance. This will help provide $26 billion in much-needed relief to individuals, families and businesses over six years while eliminating the deficit. Ontario has developed a responsible debt burden reduction strategy that will restore fiscal health, preserve critical services and help hard-working individuals and families make ends meet. It will do this in a reasonable way to protect public services for future generations. The government has a moral, fiscal and economic imperative to address the pressing debt situation and restore trust, transparency and accountability in Ontario’s finances. With these actions, the government commits to lowering Ontario’s net debt by the 2022–23 fiscal year to less than the 40.8 per cent of GDP that it inherited from the previous government. This will help ensure that future generations are not left to deal with the burden of past financial mismanagement. The government inherited the largest subnational debt in the world, which stood at over $343,000,000,000 at the end of 2018–19. 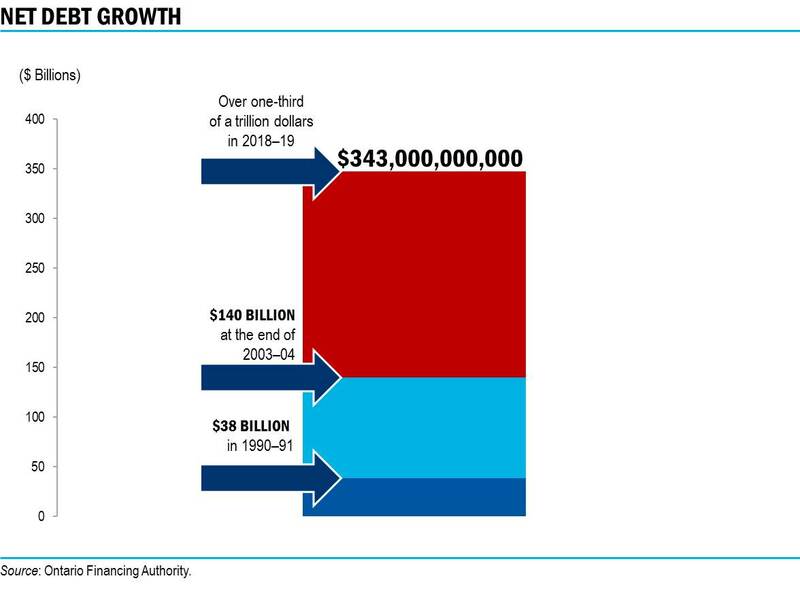 Since 2003–04, Ontario’s net debt has grown by more than $200,000,000,000. Ontario is forecast to spend over $13,300,000,000 on debt interest in 2019–20, making it the fourth largest provincial spending item after health care, education and social services. This means that almost nine cents of every dollar the Province brings in goes toward interest costs. Every dollar spent on interest is one less dollar going to Ontario’s schools and hospitals — a problem that will only get worse if the Province doesn’t take action. To show the people of Ontario that the government is accountable, the Province is introducing the proposed Fiscal Sustainability, Transparency and Accountability Act (FSTAA). Among other important new accountability measures, the proposed FSTAA would include a Premier and Minister’s Accountability Guarantee. The Guarantee would require the Premier and the Minister of Finance to pay a penalty of 10 per cent of their premier and ministerial salaries for each missed public reporting deadline. The Minister would also need to publicly explain why the deadline was missed and when the report would be released. The government will take action to reduce the debt burden. These actions will strengthen legislation, eliminate loopholes, and ensure compliance with the law. This includes new legislation that would require a debt burden reduction strategy, including net debt-to-GDP objectives, reporting on progress and repealing the Investing in Ontario Act, 2008. 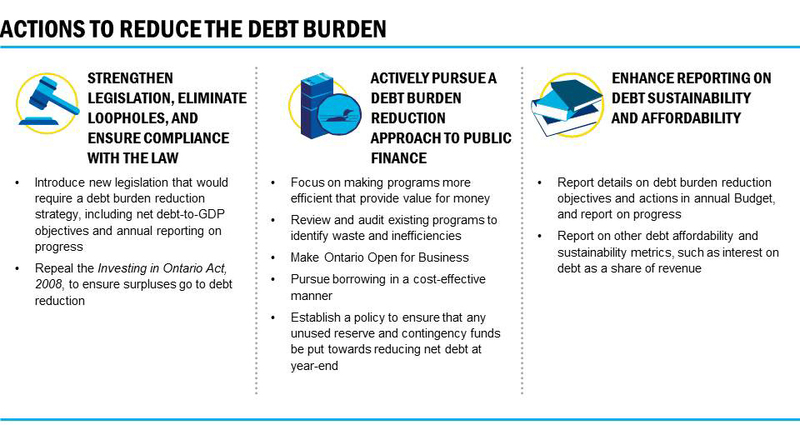 In addition, the government will actively pursue a debt burden reduction approach to public finance including: a focus on efficient programs and provide value for money, review and audit existing programs to find inefficiencies, make Ontario Open for Business, pursue borrowing in a cost-effective manner, and establish a policy to ensure that reserve and unused contingency funds are put towards reducing net debt at year-end. The government will enhance reporting on debt sustainability and affordability through reporting details on the debt burden reduction objectives and actions in the annual budget and reporting on other debt affordability and sustainability metrics, such as interest on debt as a share of revenue. Ontario’s net debt was $38 billion in 1990–91 and grew to $140 billion by 2003–04. It has since grown by more than $200 billion to over one-third of a trillion dollars in 2018–19 at $343 billion.